This is the first time I had to use this File Level Restore (FLR) feature since I use VMware Data Recovery 2.0 on site. So I thought it could be a good idea to share the steps needed to make it going. First of all know that there are two File Level Restore ports: one for Windows (VMwareRestoreClient.exe) and one for Linux (VMwareRestoreClient.tgz) and both can be found on the Data Recovery CD, under the WinFLR and LinuxFLR folders respectively. In my case I needed the Windows version because I was restoring files from the backup of a Windows VM. Let's start by copying VMwareRestoreClient.exe to the VM for which you want to restore some files. Now let's establish a RDP connection to that VM and run the copied executable (you must wait here for it to decompress then a window will appear). 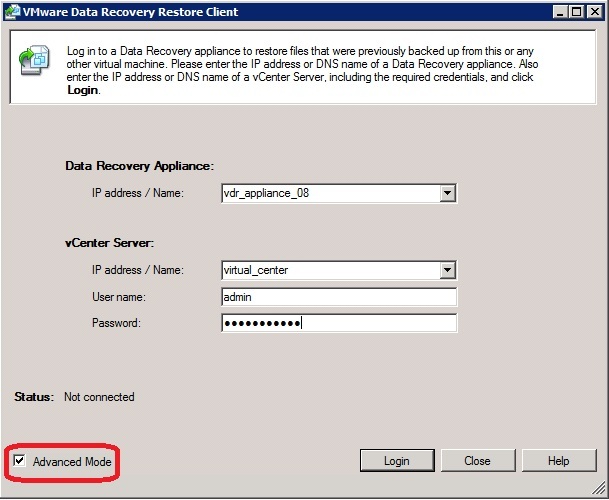 When prompted enter the IP/hostname of the VDR Appliance and select also the Advance Mode checkbox. There you need to enter the credentials to log to your Virtual Center instance and wait (it can take a very long time!) for the list of available Restore Points to load in memory. 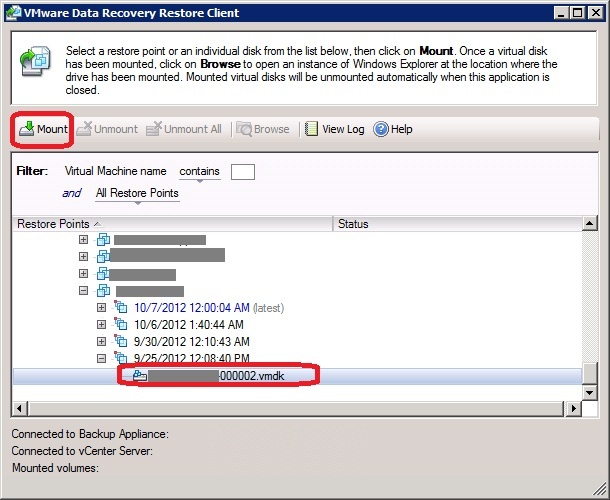 Browse through the Restore Points library, select the same VM and, once you have selected the VMDK file on which you know the files to restore are, click on Mount. The content of the selected VMDK will be mounted as a mount point on a directory named with the timestamp of the backup under the root folder (for instance: c:\10-10-2012 8.45.36). Copy the files to restore to their original locations on your VM drives and then close the FLR client. This way the VMDK will be automatically dismounted and there you are with your restore done! As I final note, know that you need TCP port 22024 open between the VM and the VDR applicance, so think to configure the firewall accordingly. For a how-to on using the Linux client, check here, here and here. I am sure many of you still use VDR and haven't migrated to VDP yet, so, if this is the case and this post helped you, please do not hesitate to tell or share! Also, if you have questions do not hesitate to ask.